Educating Illinoisans For "The Real World"
Illinois' teacher workforce is overwhelmingly white. It's student population (lower graph) is under 50 percent white. 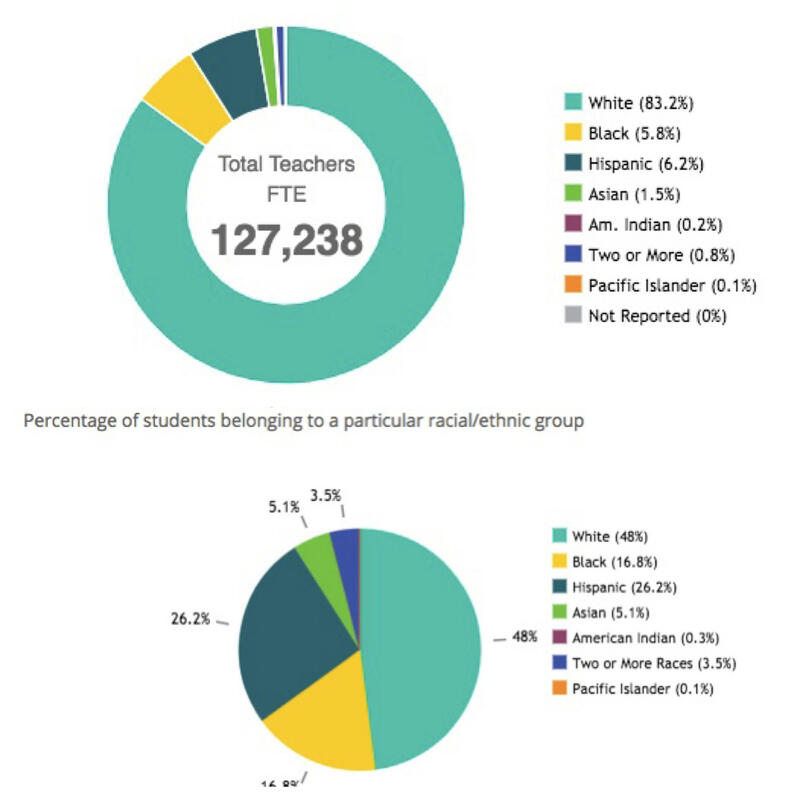 In Illinois, more than 80 percent of all public school teachers are white. But odds are, most of the children in their classrooms are Hispanic, Black, Asian, or a mixture of races. Only 48 percent of public school students are white. Emily Fox is trying to bring those numbers closer together. She is “director of educator effectiveness” at the Illinois State Board of Education. Her title is a creative way to say she’s in charge of who gets certified to teach and who doesn’t. “We oversee educator preparation, licensure, and renewal in the state. So everything to ensure that we have effective teachers in front of our state’s children,” Fox says. Illinois has joined eight other states in a new initiative to diversify the teacher workforce, and it has a similarly clunky title. Created by the national Council of Chief State School Officials, this plan is called the Diverse and Learner-Ready Teachers Initiative. These goals sound familiar to almost anyone involved in education. But this particular initiative aims even higher. How do white students benefit from having teachers of different races? How will they persuade teachers of color to move to a tiny, rural town? To flesh out these plans, Fox hopes to assemble a network of 15-20 experts from across the state. ISBE is accepting applications through November 14th. Those experts, Fox says, will figure out how to make this initiative work. She also has ideas about how to address retention of the teachers who are already working in schools. “That is important as well. That is the third component of how we’re going to utilize this network — how can we better support teachers of color who are in the profession? So a couple of things that our steering team would like to enact are one, a form of professional development for all teachers, and then for administrators, we’re talking about developing an administrator academy that focuses on how to better-support teachers of color,” she says. Other states involved in this initiative are Colorado, Delaware, Louisiana, Massachusetts, Mississippi, Nebraska, New Mexico and New York. Fox is also involved in a separate initiative called Teach Illinois, designed to address the teacher shortage. Last month, in response to a Teach Illinois report, the State Board of Education voted to remove the basic skills test as a teaching certificate requirement for individuals who already hold a bachelor’s degree from a regionally accredited institution. Some educators see that proposal as lowering standards. Fox disagrees.